Learn how to write code in Windows Store apps for Windows 8 that works with structured data in SQLite—a popular database that's familiar to Android app developers. Your app may need to work with data that's more complex than simple key-value pairs—for example, a complex sales order or a survey with comments. For these kinds of data, you may want to use a database. One popular choice is SQLite—a self-contained, zero-configuration, relational, transactional database engine—which Android and Windows Store apps both support. Reference it from a Windows Store app. Get a helper library to make your coding easier. Write code to create a database table. Add, get, change, and remove the table’s records. In Microsoft Visual Studio, on the Tools menu, click Extensions and Updates. Expand Online. If Visual Studio Gallery is not already selected, click it. In the Search Visual Studio Gallery box, type "SQLite". Next to SQLite for Windows Runtime, click Download, like this. The SQLite for Windows Runtime package in Visual Studio is similar to the android.database.sqlite package. With your app's project open in Visual Studio, in the Solution Explorer window, right-click the References folder and click Add Reference, like this. Expand Windows and click Extensions. Check the Microsoft Visual C++ Runtime Package and SQLite for Windows Runtime boxes like this, and click OK.
After you add these references, your app's project may not build or run. To fix this, in Visual Studio, on the Build menu, click Configuration Manager. In the Active solution platform box, click your specific target platform, such as ARM, x64, or x86. Then click Close. In the Search Visual Studio Gallery box, type NuGet. Next to NuGet Package Manager, click Download. If your app’s project doesn't open automatically, open it. 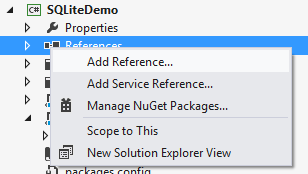 Try again: in the Solution Explorer window, right-click the References folder and click Manage NuGet Packages. In the Search Online box, type sqlite-net. Next to sqlite-net, click Install, like this. NuGet is a Visual Studio extension that makes it easier to install and update third-party libraries and tools in Visual Studio. To learn more about NuGet, see the NuGet Gallery. After you get familiar with NuGet, you may find it easier to use the command-line version of NuGet. To get to it in Visual Studio, on the Tools menu, click Library Package Manager > Package Manager Console. After you install a SQLite helper library, you're ready to write some code to create a table and to add, get, change, and remove the table's records. For this example, let's say your Windows Store app works with blog posts. These blog posts are represented as records in a SQLite database table. By using the sqlite-net package that you installed, you can define the table by coding a class that represents each blog post. In this case, each blog post has a unique ID, a title, and the post's text, like this. The PrimaryKey attribute is defined in the sqlite-net package. After you define the table, you create it using code like this. The SQLiteAsyncConnection method's "blog" parameter specifies the path to the SQLite database. The CreateTableAsync method's type corresponds to a table of type Post that was coded earlier as a class. In Android apps, you create a table that extends the SQLiteOpenHelper class with code like this. After you create a table, you can add a record to it with code like this. In Android apps, you can add a record with code like this. To read a single record, use code like this. In Android apps, you could return a Cursor object containing a single record with code like this. To read all records, use code like this. In Android apps, you could return a Cursor object containing all records with code like this. To update a record, use code like this. In Android apps, you can update a record with code like this. To delete a record, use code like this. In Android apps, you can delete a record with code like this. To learn more about how to work with SQLite, see these resources.